Choose from the wide range of Wardrobes by Exclusive Furniture World. Alpha White Gloss Two Tone 3 Door Mirrored Wardrobe3 Door Mirrored WardrobeBrand: AlphaItem: 3 Door .. 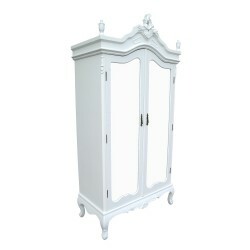 Aged Ivory Single Armoire Dimensions:H219 x W104.5 x D56.5 cm / inner size: H143 x D38.5 cm (this wa.. The Allendale wardrobe is finished in solid oak with oak veneers and features striking heavy r.. The Allendale triple wardrobe is finished in solid oak with oak veneers and features striking ..
Alpha Black Gloss & San Oak 2 Door Sliding WardrobeSliding WardrobeBrand: AlphaItem: 2 Door Slid..
Alpha Black Gloss & San Oak 2 Door Standard Wardrobe2 Door Standard WardrobeBrand: AlphaItem: 2 ..
Alpha Black Gloss & San Oak 3 Door Mirrored Wardrobe3 Door Mirrored WardrobeBrand: AlphaItem: 3 ..
Alpha Black Gloss & Walnut 2 Door Mirrored Wardrobe2 Door Mirrored WardrobeBrand: AlphaItem: 2 D..
Alpha Black Gloss & Walnut 2 Door Sliding WardrobeSliding WardrobeBrand: AlphaItem: 2 Door Slidi..
Alpha Black Gloss & Walnut 2 Door Standard Wardrobe2 Door Standard WardrobeBrand: Alpha Ite..
Alpha Black Gloss & Walnut 3 Door Mirrored Wardrobe3 Door Mirrored WardrobeBrand: AlphaItem: 3 D..
Alpha Black Gloss & Walnut 3 Door Standard Wardrobe3 Door Standard WardrobeBrand: AlphaItem: 3 D..
Alpha Black Gloss Two Tone 2 Door Mirrored Wardrobe2 Door Mirrored WardrobeBrand: AlphaItem: 2 Door ..
Alpha Black Gloss Two Tone 2 Door Standard Wardrobe2 Door Standard WardrobeBrand: AlphaItem: 2 Door ..